When it's raining, work indoors, when it's not, get gardening! Have van, have lawn mower will travel ! of it, many people don't want a knowledgable gardener, they just need someone to clear and tidy things up once in a while. The jobs which come about doing this are usually the one / two / three hour jobs which full time professional gardeners don't want to do. They're more interested in the contract work which gives them a better and simpler income. The other reason they don't want to do it is that some time is spent travelling between jobs (you may have 4 lawns to cut in a day) and all the time you're travelling, you're not earning money - so your fees and charges should reflect this. This kind of 'do jobs others don't want to do' is quite niche and there is absolutely loads of work out there from pensioners, professional people with no time on their hands and don't mind spending £20 a month on someone coming in to do something. Also, it will very often lead you into situations where they will ask you if can paint, then you get a few winsows or a bedroom to paint as well. Slowly it adds up to a nice little job with plenty of clientelle. You can advertise cheaply in shop windows, but invariably the work comes from heresay. Just have a business card with your name and phone number and you're away. In GBP it's hard to put a starting figure of investment on it because you may already havbe some decent gardening equipment and for the van, you may have traded your unwanted second car for a van. 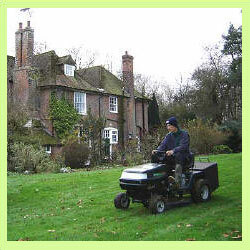 For most jobs a petrol rotary mower (21") is the most versatile and will cut most size lawns. A self-propelled mower is by far the easiest to manouver. Don't buy the cheapest, unless it's on offer that is, go for a reputable brand name with quarantee and service back up, your mower is going to have heavy mileage. You'll need all the mainline garden tools, but a petrol hedge trimmer, some good loppers, shears and lawn edger are very useful. If you're cutting the grass, offer to do the hedge as well. Again, many Builders and Gardening Maintenance Companies only want the big 'whole day' or 'whole week' jobs. There's a gap in the market for general work !